Since 1873, Villa d’Este has been considered the destination par excellence for summit events and exclusive events of international importance. Its timeless buildings, surrounded by the beauty of Lake Como, are in fact a combination of classic charm and modernity, history and sophisticated technology. All the rooms are embellished with natural light and can enjoy unrivaled privacy for events with impeccable success. It is located in the Cardinal Building. It is an elegant room with pastel colors and classic taste. Charming and welcoming, it is ideal for hosting high-level board meetings in an intimate and exclusive atmosphere. Located on the ground floor of the building in the hotel courtyard, next to the Pergami room, this room, for its exclusive and intimate structure, is ideal for high-level meetings and medium-sized business meetings. It is located on the first floor of the building in the hotel courtyard, next to the Gift Shop. Adjacent to the Gallio and Ciani rooms, it offers a wide and totally functional work environment. It is located on the first floor of the building in the hotel courtyard, near the Gift Shop. Adjacent to the Pino and Ciani hall, it offers the same combination of refined elegance and functionality, ideal conditions to create a perfect setting for business meetings. It has been designed for meetings of up to 60 people. Located on the first floor of the building in the hotel courtyard, near the Gift Shop, stands out for its comfort and efficiency. It can accommodate up to 40 people. Majestic and spacious, it takes its name from the building where it is located, the Queen's Pavilion. It is the scene of important meetings in a totally private space. It has a modular structure that allows it to be divided into three separate rooms for 40, 50 and 60 people. It is extremely functional, being equipped with simultaneous translation booths. The room overlooks the lake with a private terrace and also has a foyer, an ideal place for work breaks and refreshments. Located between the Queen's Pavilion and the Grill Restaurant, it is characterized by a vaulted roof and a suggestive terrace overlooking the lake where cocktails can be organized. This room is perfect for both business meetings and celebratory events. It is located on the ground floor of the building in the hotel courtyard, next to the Gift Shop and the Torlonia hall. It is the ideal place for medium-sized business meetings. Located in the Cardinal Building, in the heart of the property, it is a majestic and regal hall, with a truly magical atmosphere. Richly decorated, it is perfect for important banquets, gala dinners, cocktails and unforgettable events. It is no coincidence that it is the favourite salon for wedding receptions. 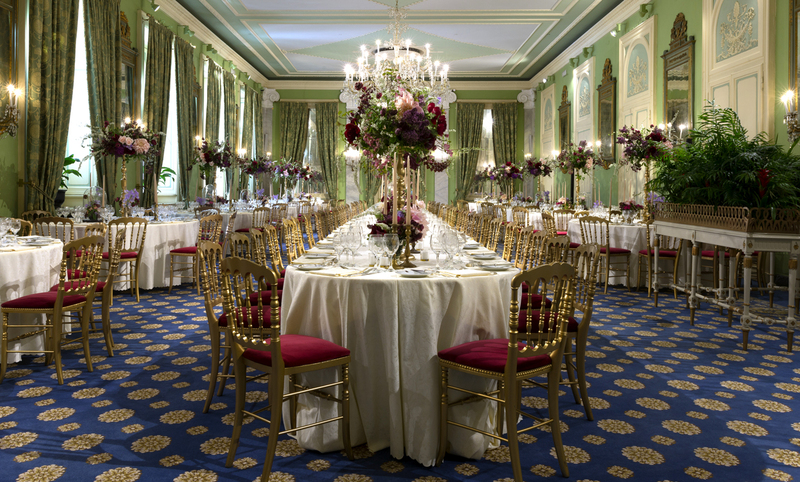 Located in the Cardinal Building, in the heart of the property, the Sala Colonne is the ideal place for events of great elegance and sumptuousness. Marble floors, crystal chandeliers and precious frescoes adorn the hall. The walls, which tell of banquets and festivals of bygone times, are today the background for refined receptions: buffets, cocktails, gala dinners. The Corinthian columns dominate the architecture and a French window opens onto the terrace and gardens, giving further traits of charm to this location. This charming room, located in the Cardinal Building and near the Veranda restaurant, was created on the occasion of a visit by Napoleon. Today it is an intimate place, ideal for small banquets, receptions, lunches and gala dinners. Decorated with golden brocades on the walls, it is further embellished by the reflections of the soft lights on the elegant mirrors.